At Window World of Toledo, we’re committed to finding the perfect replacement door for your home. We take you through every step of the process, from your complimentary in-home estimate all the way through our expert installation service. We’re proud to offer products that boast strength, security and durability, so browse our options below and contact us to get started! Is your entry door making the right first impression? Don’t let your home’s curb appeal fall short due to an out-of-date look. Click the button below to explore all of our door styles! Open up your home to the beautiful outdoors with patio doors from Window World of Toledo. Created with expanded glass areas to let more natural light in, these options are great for adding warmth to your space year-round. Elegance has never been more affordable. French rail doors add style and functionality to your living space. Learn more by clicking the button below! 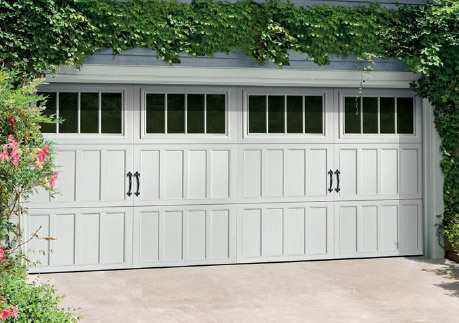 With over 30 panel styles to choose from, a variety of attractive collections and both insulated and non-insulated options, there’s no wonder garage doors from Window World are the clear choice. Storm Doors offer protection against the outside elements, while also allowing added light into your entryway. Storm Doors can also add an elegant statement to your home.